Bulgaria is a small but beautiful country in South Eastern Europe. It is in the Balkan Peninsula, to be more exact. Nevertheless, if you choose to take a trip there, you will not be disappointed. Sofia, the capital, is a charming city with a lot of history for those who are seeking it. But even so, the most sought out attractions are the beaches. In the summer, which lasts from June to September, the beaches are vibrant places with lots of tourists, a lot of fun, and exceptional food. Not to mention that everything is cheap. People from the neighboring countries come every summer to Bulgaria. Its coast on the Black Sea is spectacular. In the region, Bulgaria is known as the ‘Golden Sands.’ Before you go on your trip to Bulgaria, you need to see if you need a visa to cross the border. What you need to know is that Bulgaria is a member of the European Union, which means that all EU citizens, as well as a few other nationalities, can enter its territory without a visa for a period that cannot exceed 90 days. However, just because Bulgaria is a part of the EU, it does not make it automatically a part of the Schengen Area Agreement. In fact, it is, but it is not yet implemented. Border checks still happen to this day. However, if you already have a valid Schengen visa, you can enter Bulgaria for no more than 90 days within a 180-day period. To find out whether or not you need a Bulgaria visa, you can read its visa policy. Or, and this is easier, you can use iVisa’s Visa Checker. We developed this tool that tells you whatever you need to know. Just select your nationality and choose Bulgaria as your destination. In only a second, the Visa Checker displays the information you need. And that is not all. If you do require a visa to enter Bulgaria, you will receive a list of available embassies in your area. We regret to inform you that we do not process Bulgaria visa applications at the moment. We plan to do it I the feature, but until then, we are happy to help as little as possible. Our support service is at your disposal 24/7, and our consultants are ready to help you. The service is free of charge. When it comes to requirements (in the event that you do need a visa for Bulgaria), you need to inquire about them. The internet is an excellent source, but it is not always the most reliable. That is why our recommendation is for you to call the embassy and ask them about the conditions you need to meet. The internet info should be used as reference only. 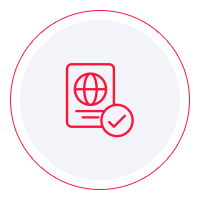 But we can tell you that you need a valid passport even if you do not require a visa. The passport needs to have at least one blank page for the stamps, and it must be valid for at least another 6 months from the date of departure from Bulgaria. Although we cannot process Bulgaria visa applications at the moment, we plan to do it in the future. Until then, we hope that your visa application process at the embassy goes as smoothly as possible.